Topaz DeNoise 6.0 – Excels at removing noise while preserving image detail. Topaz DeNoise gives you great noise reduction without having to upgrade your lens. Why do we pay more for one lens vs. another? One big reason is that the higher-quality lens lets in more light. When available light is an issue, using a better lens often lets us take photos that we otherwise wouldn’t be able to get. It’s the same way with noise reduction. You’d normally get ugly image noise by using a fast shutter speed in low light, but Topaz DeNoise can make you feel like there was never any noise at all. It’s almost like having a photographic superpower. Like a $1,600 lens, DeNoise doesn’t just make your photos look better… it allows you to get shots you otherwise would miss. Most noise reduction tools try to do dozens of different things. Not Topaz DeNoise. It focuses on doing just one thing well: removing noise while keeping detail. If you’ve used other noise reduction before, you’ll be stunned by the image quality you get with DeNoise. It’ll remind you of the difference between a DSLR and a phone camera. Next story Sublime Text 3107 – Sophisticated text editor for code, markup, and prose (beta). Previous story OCRKit 16.2.23 – Convert PDF or image graphics into searchable PDF. 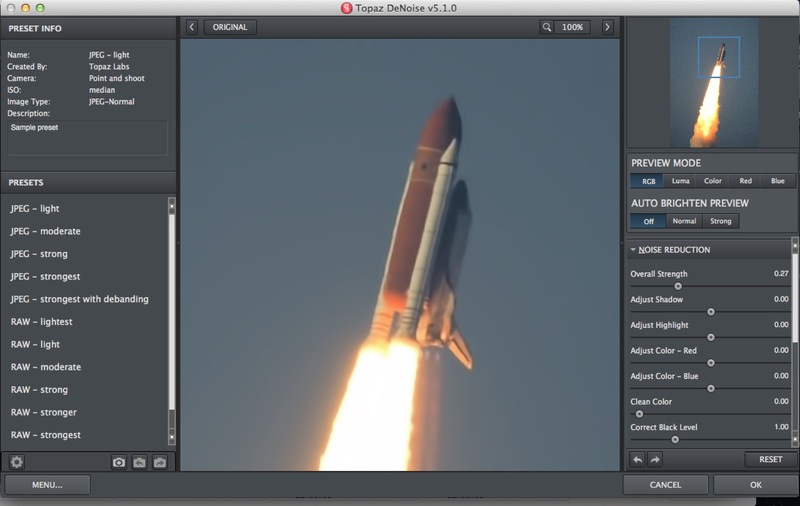 iFoto Denoise 2.1 – Photo/Image Noise Reduction. Anamorphic Pro 1.0 – Edit iPhone Portrait Mode photos on your Mac. Smart Shooter 3.37 – Fully control your camera from from your Mac.